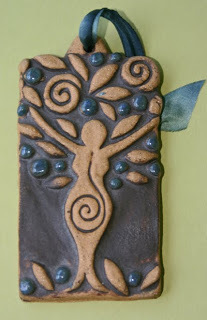 When Sarah announced the Terra Cotta Tile project as part of the Flying Hearts Fundraiser, I was eager to participate. I am a huge fan of tiles as it is, and the chance to play with one of her stylized horse designs was too tempting. I have to admit, however, to being intimidated by terra cotta. It’s not that I haven’t tried it. I was so taken with some of Lynn Fraley’s samples during Mayhem a few years ago that I had some terra cotta slip shipped back to Charlotte. I even cast a number of medallions with it, though until yesterday that was as far as I got. That’s because Lynn was also generous enough to send us back with some of her Laf’n Bear test tiles in terra cotta to use for glaze testing. I am sorry to say that these two guys were among the less ugly things I managed to do to her tiles. I seemed to have a knack for turning terra cotta into a shiny brown blob, no matter what glaze combination I tried. Terra cotta clay creates red dust which contaminates everything around it, so I put the slip away and told myself I would try again another day. Since Sarah has already started pressing tiles – and since they are all made from terra cotta clay – I realize that the time to face my terra cotta terror is now. Fortunately, I did pour a number of test medallions with the slip before I threw in the towel, so I won’t be forced to experiment on the “good” tiles when they arrive! The sad part is that I have always loved the look of darker clay on tiles. The tile above, made by my friend Melanie Brooks at Earthenwood Studio, is still one of my favorites. 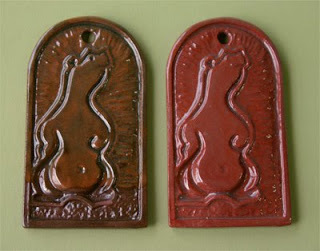 It is not terra cotta, but she did the same kind of glaze on a terra cotta colored tile of a wolf that I gave my sister-in-law a few years ago and I’ve always loved the look. Melanie works in stoneware, though, and I’m trying to find a way to get a similar look without leaving the earthenware clay bare. Hopefully I won’t run out of test pieces before I find something that works! After the post earlier this week about plaster, I received an email asking what type of clay I used. 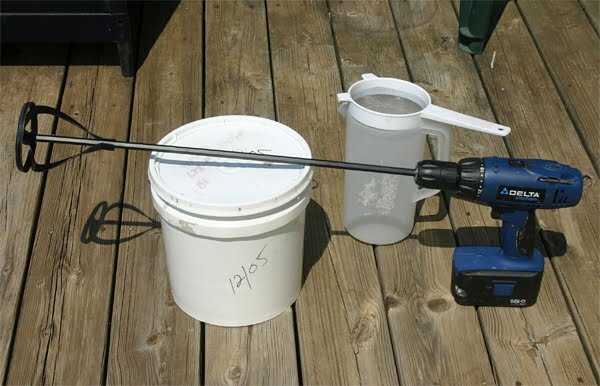 The question came at a good time, since I was in the process of mixing a new bucket. 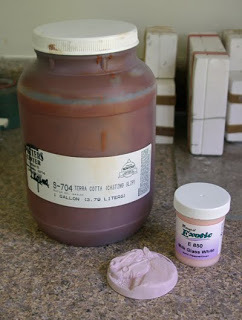 Since most of the things I make are tiny, a two-gallon bucket of slip like the one in the picture above usually lasts me about a year. White earthenware slip is widely available in the United States, and it comes in seemingly infinite varieties. I use a type based on the old Hagen-Renaker recipe. Hagen-Renaker was a pioneer in the production of high-quality, highly detailed ceramic animals. It was later used at Pour Horse, which is how I first learned about it. Having used other commercially available slip, I can’t imagine using anything else. The formula has an unusually high talc content, which I’m told is why it fires extremely white and retains an amazing amount of detail. Certainly if I cast something in “regular” slip and “good” slip, I can tell by the touch which castings are which. I should mention that the supplies in the picture aren’t for making the slip from raw ingredients. Since I don’t have the space for the kind of equipment that takes, I purchase it from another potter ready-made. It comes in two-gallon buckets which I use to store it. When I am casting, I keep a working quantity in the pitcher. There is a strainer over the top of the pitcher so I can pour the slip from the bucket to the pitcher without getting any dried bits from the rim. I also had someone write to me about how hard it was to mix the slip by hand. The slip is suprisingly heavy, and it sometimes thickens after it sits, so mixing with a hand tool would be a fair bit of work. 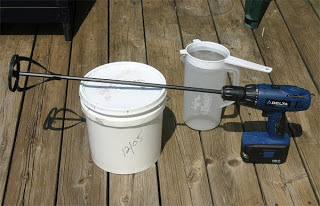 I use a cement mixing attachment that fits into my husband’s cordless drill. (This is why he can never, ever find this particular tool – it’s usually in my studio.) It isn’t in the picture, but I also use a small handheld mixer for whenever I need to remix the slip in the pitcher. The date on the bucket indicates when the slip was made. In this case, it is five year-old slip. Slip works best when it has aged. Since I fear losing my supplier and having to make my own, I tend to hoard it. I use it so slowly, aging has never been a problem here! That might change, however, when I add the larger pieces to the production line later this year. As a side note, a friend pointed out that I could set comments on moderation, which would allow me to screen for spam. I am going to do that later today, since I really do prefer to keep them turned on. I am a firm believer that conversations among people often lead to new information, and that doesn’t work as well when the conversation is one-sided. I love talking to folks who read the blog, but I like it even better when readers can also hear one another.